Last March, we'd celebrated Maisie Dobbs month and it's that same time of the year again. While I'd reviewed The Mapping of Love and Death - this time I'd like to spend time on A Lesson in Secrets. 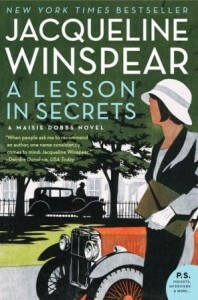 Set in 1932, A Lesson in Secrets opens with Maisie Dobbs having undergone some significant changes in her life. She's much better situated as her mentor Maurice Blanche passed away and named her as his the main beneficiary of his estate. She is now a woman of means. Her financial independence has brought her greater confidence, freedom and a deeper sense of guilt/responsibility to Blanche's memory. I couldn't help notice that Maisie's guilt in her good fortune led her to intervene in the lives of the people around her with generous and large, sometimes life changing gestures. In this adventure, Maisie is asked to aid Scotland Yard's Special Branch and the Secret Service in an undercover operation in Cambridge. Maisie takes the post of lecturer at a small private college to monitor behavior that is "against the interests of His Majesty's Government and the Crown." The college's founder, Greville Liddicotte, is committed to the development of international peace and to pacifism. Liddicotte is famous for writing a children's book that encouraged children to bring their fathers home from the war. The book was restricted, pulled off the shelves. Maisie later learns that the book was so effective that there are whispers of its having led men to mutiny, to refuse to fight during World War I. When Liddicotte is found murdered in his office, Maisie finds herself trying to find the killer while continuing to track dangerous behavior at the college. This is the time of the rise of National Socialism in Germany and Adolf Hitler's message seems to resonate with some of Maisie's students. Maisie sorts through clues about Liddicotte's death and the mysterious behavior of her fellow professors while balancing the ups and downs of her love affair with Viscount James Compton. I particularly enjoyed A Lesson in Secrets - it's now my favorite Maisie Dobbs novel because Maisie's more comfortable with herself and her place in society. While there is some uncertainty regarding her future with James Compton, she is willing to trust in the relationship, to take things a day at a time. This time her job involves more than the usual mystery. 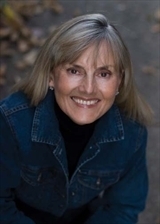 By having Maisie Dobbs work for the Secret Service In Lesson in Secrets, Jacqueline Winspear and Maisie Dobbs tackled the treatment of conscientious objectors during World War I, and of returning veterans as well as the lack of awareness of the dangers of Adolf Hitler and the growing power of Germany's National Socialist movement. Publisher: Harper Perennial; Reprint edition (March 6, 2012), 352 pages. Review copy courtesy of the publisher and TLC Book Tours. I've only read the first book in the series but I'm looking forward to continuing. I hope I enjoy this installment as much as you did! Sounds like this book covers a lot of meaty material! Thanks for being on the tour!